Historically, human society has maintained itself through the coexistence of distinct varieties of peripheral forces standing in opposition to a single, authoritative power that rules from the center. Referring to the coexistence of different languages as well as the conflicts between them, the term “heteroglossia” also reflects the plurality and fluidity that characterizes our contemporary culture and society. Since the end of the last millennium, the wave of globalization has lent momentum to the acceleration of this movement towards pluralism. Meanwhile this same globalization has also witnessed the expansion of nationalism and the increased tension and segregation that has emerged on territorial borders. In other words, along with the consequences of global standardization at the superficial level, radical changes have simultaneously germinated within society. In our current century, contemporaneity transcends national boundaries and embraces integration, plurality, and fluidity as its core values. 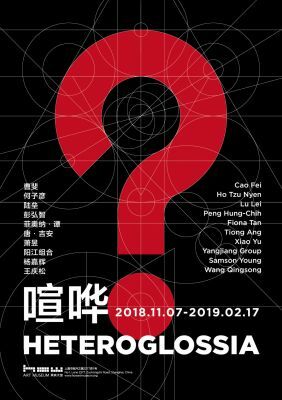 Situated in the context of contemporaneity, the exhibition Heteroglossia showcases artworks by ten artists from across different countries and regions of the world. Their practices have been exposed to the general influence of Chinese culture, yet they have evolved along different trajectories by incorporating distinct varieties of historical experience, memory, and identity. Their works make use of the media and materials produced by and populating our current society, and forms a constellation that offers unique observations on as well as distinct insights into each specific site and zeit they inhabit. Featured in this exhibition are installations, moving image works, and performances, among other forms of art. Together, the works strive to dissolve the traditionally defined and physically constructed boundaries of the museum. Thus they interact with each viewer on the level of reflection and revelation, as well as with society as a whole. Through this presentation the curatorial team at HOW Art Museum wishes to build a platform for dialogue, and to convey to the public our thoughts and concerns on the “contemporary”.